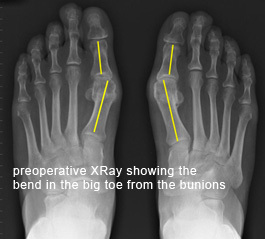 A bunion is a painful lump on the inside edge of the main big toe joint. The term hallux valgus is derived from Latin and refers to the main big toe bone (metatarsal) pointing inwards (valgus). This bony prominence rubs against foot wear and becomes painful and inflamed. Symptoms are not necessarily related to the size of the bunion with some small ones being very painful and some larger ones causing few problems. 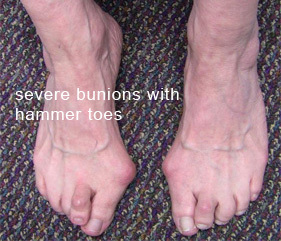 Bunions mainly run through families (although not every family member may be affected) but are also aggravated and can be caused by foot wear. Occasionally bunions can be caused by other conditions such as rheumatoid arthritis. Bunions worsen with time although deterioration can be slow. 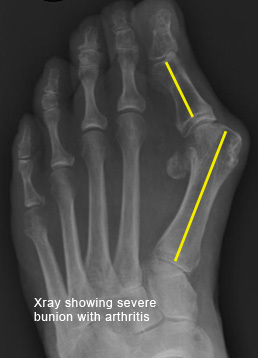 Over time they can cause arthritis of the big toe joint. Other problems can be caused by bunions. As the bunion worsens the big toe metatarsal elevates putting more pressure onto the ball of foot causing pain (metatarsalgia). With time corns will develop on the underside of the foot. The big toe (hallux) presses against the second toe which can be painful, especially if soft corns develop. With time the second toe will bend and contract, called a hammer toe. This can also rub against the top of a shoe as well as making the metatarsalgia worse. The speed at which a bunion deteriorates may accelerate as a hammer toe develops as the second toe can act as a supporting buttress. Hammering may also develop in all the other small (lesser) toes. The goal of treatment is help relieve pain and, secondarily if surgery is carried out, to improve the cosmetic appearance. Essentially there are two ways to treat a bunion; make the shoe fit the foot or make the foot fit a standard shoe. Non-surgical treatment involves fitting accommodative shoes to relieve pressure over painful pressure areas. These shoes will be a wide fit and relatively deep at the end of the shoe. There are many different surgical treatments possible. The one best suited to your needs can only be determined after a consultation including examination and X-Rays. There two main types of surgery that can be performed. The first is a well-proven technique called a scarf osteotomy. 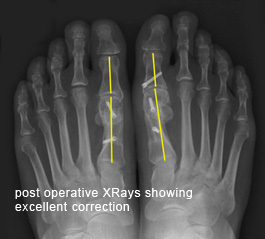 This realigns the toe, normally through one relatively small incision on the inside of the foot. This is a well established technique which Mr Molloy has published research on and given lectures on both nationally and internationally. At the North West Foot and Ankle Clinic we are also pleased to offer minimally invasive surgery (keyhole bunion surgery). Keyhole bunion surgery is carried out through very small cuts , providing the same correction of the toe with the possibility of a better cosmetic result and a quicker return to function. There is no need for a plaster with either a scarf osteotomy of keyhole bunion surgery. Patients can bear weight as able in their post-operative sandal. For the first few weeks this involves getting up for necessities (tea, toast and toilet!) as it is important to keep the foot elevated. It is relatively common for other procedures to be carried out at the same time (eg straightening of lesser toes). A decision as to which is the best form of treatment for you can be made after your consultation. 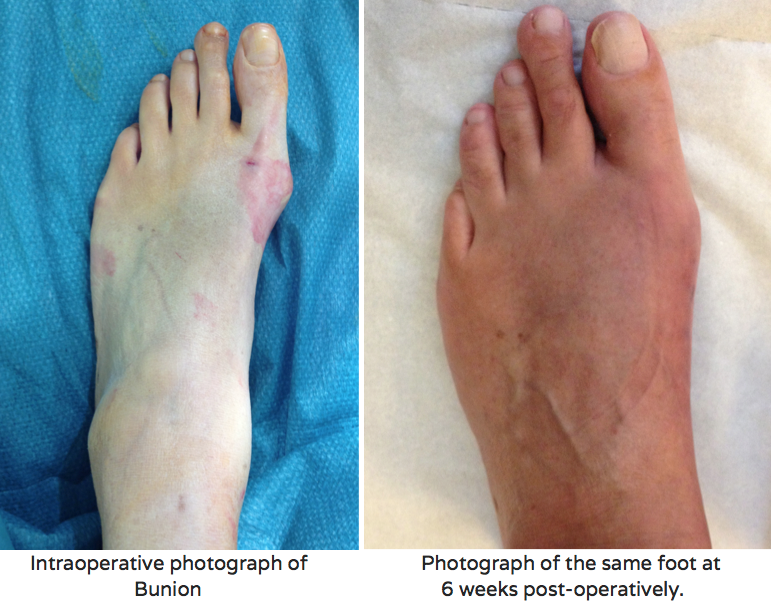 In some more severe types of bunion or if significant arthritis is present, fusion surgery may be necessary. Function can still be extremely good after this type of surgery and again this will be discussed in your consultation.